Snorkeling offers a similar breathtaking experience that you get from diving, but without needing to take a deep plunge into the water. You can still view beautiful coral reefs off the coast, tropical fish, and entire underwater ecosystems without the need for a diving tank. However, to have a great snorkeling experience, you need a great snorkel mask. If you find yourself looking for a full-face model, be sure to check out these best full face snorkel masks. Quick Answers: What Are The Top Full Face Masks? Here is a quick feature overview of my 5 favorite full face snorkel masks, all come with full reviews later on in this page with a details full face snorkel mask buying guide below. The first model on the list is designed to work with the GoPro. There are numerous features that make it a great choice for your dive. This model does not have an internal breath tube, but it is foldable. This means you can easily tuck it away until the next time you snorkel, without worrying about losing it. The dual-vent air system, paired with the breathing tube, work excellently to block water. There is a ball inside the snorkel that prevents water from getting inside once submerged. As you exit the water, the ball moves to allow air to flow into the mask again. The straps and skirting of this mask has been designed with comfort in mind. The straps are made of a soft elastic material. Unlike other straps, these will not get stuck in your hair. Additionally, a silica gel skirt lets the mask conform to your face, but in a comfortable, airtight way. The view offered by this mask is made unique by the lens. In addition to a dual-flow air vent system, the mask is unlikely to fog up. If it does, however, there is an anti-fog coating on the lens. The lens is also flat, rather than being rounded. This means you get the whole 180-degree view, instead of a bubbled version. Finally, a frosted edge prevents scratching that limits your line of vision. The many features of the lens are great. If you have a long or large nose bridge, however, you should note that the flat-style can leave your nose feeling a little squashed inside the mask. This mask makes using a GoPro easy. It attaches to the upper part of the mask with a mount. The mount is detachable, which is great because you might not want to carry around extra bulk when you do not have your GoPro with you. It also means that you can easily disconnect while snorkeling to quickly catch something on camera. Something that snorkelers with sensitive ears will appreciate is the included ear plugs. These are removable so you do not have to wear them, but they are conveniently attached to the mask if you need to keep the water out. There is also a drain valve included. If water does happen to get in your mask, you will not need to remove it before diving down again. Instead, use the drain valve to conveniently empty the mask. Finally, there is a convenient carrying bag to keep your mask secure. Inside, you will also find anti-fog inserts by GoPro, as another measure to cut down on fog. The major downside of this model is that there are numerous third-party companies who mimic and sell this product. Though the full-face mask looks the same in both cases, it is not the same quality. Buy from an authorized seller to prevent many of the problems consumers have reported with this mask. Fortunately, if you do have doubts, the selling company (X-Lounger) has included a guide that shows the difference between their authentic mask and frauds. This full-face snorkel lets you see with an incredible 180-degree view, all while breathing easily with a full ventilation system. The 180-degree field of view lets you look in front of you, as well as to the sides. This means that you do not have to worry about missing something incredible while you are distracted by a beautiful school of fish. To accompany the viewing experience, this snorkeling mask has a camera mount included. This lets you easily attach almost any waterproof sports camera, so you can take incredible underwater pictures. After all, even though the pictures will live on forever in your memory, it does not mean you will not want to show them off! The one disadvantage of this mask, however, is that it may not be suitable for cold waters. With cold water and warm breath, the mask can fog up. The wide, secure strap and silicone seal help you adjust the mask to fit your needs. Still, it comes in sizes extra small, small-to-medium, and large-to-extra-large. This wide range means that you can get the same great mask for the whole family. For the best results with sizing, it is highly advised that you look at the sizing chart. 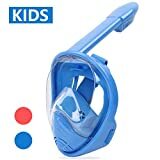 This snorkeling mask is uniquely engineered to allow you to breathe easily, while preventing leakage. You can also go a little farther down than with a traditional snorkel, without the worry of swallowing water. The thick buckle strap helps fit the mask securely to your face. It is also easily adjustable. Finally, the silicone seal and ergonomic design ensure that it fits the curves of any face- to keep water out no matter what. When cared for, this snorkeling mask could easily function for many years. The included carrying bag will help you keep it protected from the elements. It also makes it easy to carry. Another great feature is the wide range of color options for this mask, which let men or women show off their personality. With sizes from extra-small to extra-large, these masks will be a great fit for the whole family. An adjustable strap, variety of sizes, and silicone skirting let this mask fit any snorkeler. Some customers have reported that the masks do not always fit with a water-tight seal. However, the problem is often over-tightening of the mask. If it is too tight, the mask will push into the structure of your face and will not be able to form a proper seal. Try loosening for a more natural fit, before giving up altogether. Fog is one of the most annoying things that a snorkeler can deal with, especially since you must take the mask off to see clearly again. This is not a problem with this model, because of its unique breathing chamber. The breathing chamber is separate from the lens that you see out of, so you never have to worry about fog. This also features a 180-degree panoramic view, because of the flat lens design. The lens is made of a polycarbonate material, which offers a clear design. It is also resistant to scratching. Breathing in this mask is very easy. It features the buoyancy ball design, where the ball will cover the breathing hole of the snorkel when you are submerged. This means that you can go down as far as you would like, until you need to resurface to breathe. As soon as you come out of the water, the tube will allow you to breathe freely again. The downside is that the snorkel is not fully secured to the mask. This can leave it a little floppy, so you may not be able to get air the second you resurface. Unlike any of the previous models on the list, this snorkeling mask by Octobermoon comes an unlimited warranty for the first 90 days after your purchase. Additionally, there is a money back guarantee if you are not completely satisfied using this mask. The warranty is nice because it shows that the company is confident in the product they are selling. Like the other best full-face masks reviewed so far, this snorkel mask comes with a carrying bag. Additionally, the breathing tube can be secured with the straps of the mask to keep the set together. The straps of this mask are also very nice. They are almost like a cloth because of their softness, but they are made of a soft elastic. This means you do not have to worry about your mask pulling your hair out. This mask has many notable features, including its unique adjustable straps and the rainbow lenses. The first thing that has to be mentioned about this mask is the incredible view. Like the other models on this list, it has a flat lens for that 180-degree view. Unlike the other models, it features a rainbow lens that gives you an incredibly vivid picture. The rainbow lens offers an HD-view of what is going on under the sea. You see everything in bright, vivid colors not able to be perceived through a polycarbonate lens. Additionally, it has UV-400 protection, so you will be protected from the light whether on sea or land. The breathability of this mask is enhanced by a snorkeling tube that is longer and wider than the industry average. It features a dry top design, to keep water out of your mask. This design allows you to dive a little deeper than three-feet while keeping water at bay. A unique breathing system exists using an external chamber. This is located outside of the lens, which means you never breathe in the viewing area of the mask. Not only does this prevent fog, you do not have to worry about your own hot breath bothering your face while you dive. Another innovative feature of this mask is its secure fit design. On the back of the mask, there is a clasp with four separate straps to help fit your mask. This means that it will hug flawlessly to every curve of your face for an airtight seal. While this was the case for most people, some purchasers did not like the design of the straps. The button on the back (where the clasp is) releases the straps, but it can be hard to push. The advantage of this design is that the mask will not need adjusted every time you put it on. With shatterproof glass and durable materials, this mask is intended to be your snorkeling buddy for many years to come. This model is a dry top snorkeling mask, designed to allow air to flow freely in and out of the mask, while preventing water from entering. When you breathe in, the air comes from the dry top and circulates in a nose/mouth area. Exhaling causes air to leave following the same route. The snorkel fits well on this mask and stays in place while diving. This means you do not have to worry about losing the snorkel tube or having trouble breathing. Wouldn’t it be great if fitting a mask was as easy as taking in the water’s view? With this mask, it is. All you need to do is press a single button to adjust this mask. Additionally, the non-toxic silicon straps and skirting will fit securely to your face. The glass lens full-face snorkeling mask offers a breathtaking view. Though you must be careful not to scratch it, a well-maintained lens will offer a clearer, more vivid picture than a polycarbonate or plastic lens will. This model also features a 180-degree viewing field, so you never miss a thing. The unique breathing route prevents this mask from fogging up. Additionally, a valve located on the front of the mask lets any air that may accumulate out, while continuing to hold the water out as well. Sometimes, even snorkel masks with the best fit may slip and let water in. If water enters your mask, it is stored in a separate chamber located on the lower part of the snorkeling equipment. A draining chamber lets this seep back out into the water around you. While this mask does not come with a warranty, it does come with a satisfaction guarantee. The selling company has made a commitment so that if you are dissatisfied, you can be reimbursed. This means that you have nothing to lose by trying the mask. Whether you are an experienced snorkeler or just starting to get your feet wet, something that can greatly impact your snorkeling experience is the mask you choose to wear. It affects what you will be able to see underwater and how clearly, as well as how dry your face will stay while you are snorkeling. Here is what you need to know about how to buy a full-face snorkel mask. Have you ever accidentally breathed through your nose while wearing a traditional diving mask, making it necessary for you to resurface and let the fog out of your mouth? In a full-face mask, because you must breathe into it, a ventilation system is necessary. Most high quality snorkel masks feature an air flow vent system. When you are wearing a full-face snorkel mask with a full-face, it is important that you can keep your face dry. Ideally, choose the best full face snorkel mask with a built-in dry snorkel. These types of snorkels seal at the top, so that even when you submerge the snorkel you do not end up choking on water. Snorkeling can be fun to do in the pool, but most people use full-face masks to explore beautiful plants and animals in oceans, lakes, rivers, and streams. For this reason, you want a full view of the surrounding area when you snorkel. The best full face snorkeling masks will offer full 180-degree view, which is your entire line of vision in front of you and on the sides. You will also want to be sure the mask does not fog and obstruct your vision. The material of the lens can influence fogging, so choose a tempered lens over plastic. Not only will you not be able to see if your mask is not airtight, the water flooding inside can make you choke. For the mask to be airtight, it must fit properly. 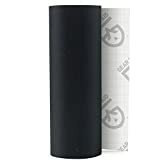 You should also choose a material like silicone for the skirting seal around the mask, instead of PVC or rubber. The final thing that you should consider is the fit of the mask. Ideally, you want a snorkeling mask with an adjustable strap in the back. If it is thick, then it will secure better to your hair. If you are having trouble securing the mask, be sure there are no strands of hair that are impeding the skirt. There are numerous features that may be included with a full-face mask for snorkeling. This includes mounts for cameras or GoPros, in addition to things like included carrying bags or easy-to-adjust straps. Decide what is most important for you and shop for a breathing mask that fits your unique needs. This snorkeling mask was chosen as best because of its unique view. The HD, rainbow mirror lenses not only keep your eyes safe, they offer a breathtaking view underwater. It comes with all the basic features you’d expect from a full-face snorkeling mask, but is enhanced because of the lens. Even though the button for removing the mask is a little hard to press, this small flaw can easily be overlooked considering all the other great features of this mask.